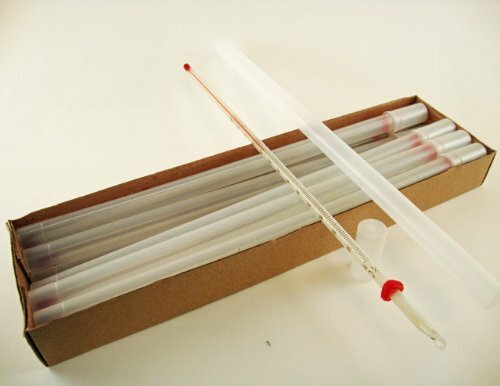 Laboratory Thermometer, Total Immersion, Pack of 10 by MHB at Samuel Young Lab. MPN: ME20. Hurry! Limited time offer. Offer valid only while supplies last. Safer than a mercury thermometer for school use, these thermometers are red spirit filled with white background for high contrast and easy reading. Safer than a mercury thermometer for school use, these thermometers are red spirit filled with white background for high contrast and easy reading. 12" long, includes roll guard and storage tube. Dual Scale range is Dual Scale -20 to 110 C. / 0 to 230 F. Save on the 10 pack, a good choice for classroom or laboratory use where some breakage can be expected. Save on a 10 pack! View More In Lab & Scientific Products. If you have any questions about this product by MHB, contact us by completing and submitting the form below. If you are looking for a specif part number, please include it with your message. Funny Science Themed"Gym Rat" Sports Bottle, 25 oz.